Shout Ridge Apartments, Crimson Hill, sold out in less than 10 days after their release to the market. The 47 apartments, priced from $575,000 for a one-bedroom and from $730,000 for two-bedroom made a total sales value of $36.25 million. Curtis Field, Director of Residential at Colliers International said buyers had waited three months for their chance to buy. 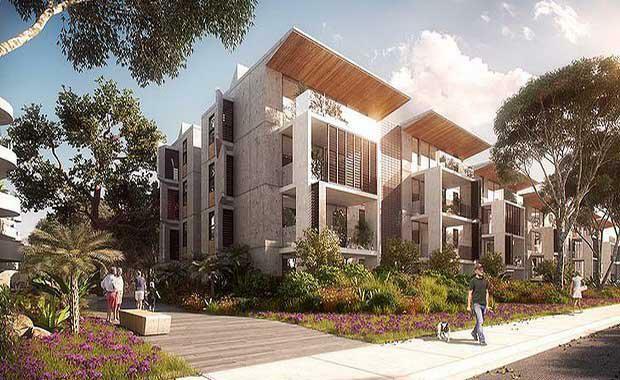 “An unprecedented percentage of purchasers had already bought at the project in earlier stages; and an equally high proportion of buyers had come via referral,” Mr Field said. The apartments, situated across two buildings, features wave-like balconies that cascade gracefully into the surrounding Lane Cove National Park. One of the most striking features of the Shout Ridge design is the distinctly different facades at the front and rear of the buildings. The entrance reveals a strong symmetrical framing around the first three levels of apartments. At the top level, a soaring, cantilevered, timber-clad roofline opens balconies up to northern sun. The other side of the building presents an elegant curved façade that reads almost as a series of pavilions. “Shout Ridge effectively has two facades, which lends a distinct architectural point of difference for the whole project,” said Mr Howman. The apartments have generous open plan interiors that combine the well-planned placement of doors and walkways to provide efficient and flexible floor space.